How come no one leaves voicemail anymore? An interesting article in the New York Times titled “You have voicemail. 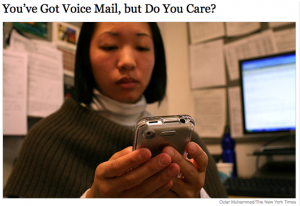 Do you care?” shows that up to 70% potential customers don’t leave voicemails anymore. Why? The article suggests that even amongst the older population, consumers have become accustomed to ‘instant gratification’ features such as SMS text or even e-mail. It’s even more compelling that at a couple of dollars per answered call, on demand answering services (can I plug Halloo’s Live Answering Service here?) make ROI sense. It’s not just about better customer service anymore, it’s about making sure you don’t lose your customers to voicemail.